An endowment is a repository for financial gifts given to an institution, with a special purpose stated by the donor. 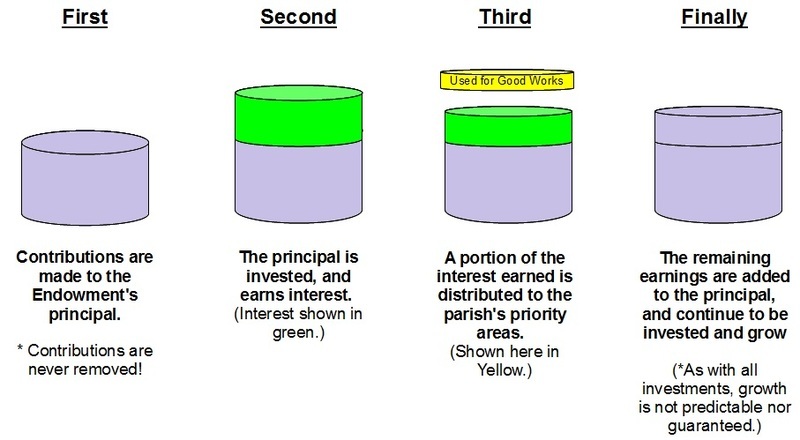 Our Endowment is designed to preserve the principal (the original gift), while using part of the interest money earned to support the work of the Parish. The money donated to the Endowment fund is invested such that we use only a portion of each year’s investment earnings for priority parish and/or school projects. What makes our Endowment unique is that the original gift is never spent! It continues to earn interest forever, or “in perpetuity”. Therefore, your gift today will continue to benefit the OLL community year after year…..forever! To get a better understanding see the graphic explanation below. You can donate to the Church OR to the School or a combination thereof. To make a donation to the Church or School Endowment Fund, please contact Rhonda Eurich, Parish Administrator at 952.472.1284 x161 or contact Finance Committee members Lee LaBore at cklabore@gmail.com or Dave Fasching at dfaschi1@yahoo.com for more details of Endowment Fund.